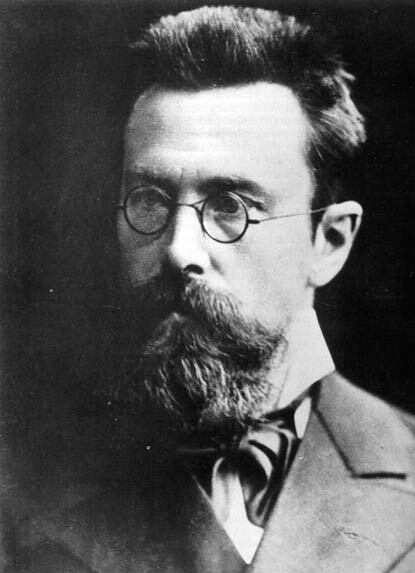 Nikolai Andreyevich Rimsky-Korsakov was born into an aristocratic family, in Tikhvin, near Novgorod in 1844. As a child he was a gifted pianist, but his family did not regard music as a suitable career for someone of his social status, and sent him to the School for Mathematical and Navigational Sciences in St. Petersburg to train as a naval officer. During his education he became involved with the thriving musical life of the capital, meeting Mily Balakirev in 1861. Balakirev had an established reputation as a musician and greatly encouraged the young Nikolai in composition. The same period marked the beginning of the group of amateur composers known as "the five" or the "mighty handful". They were Balakirev, Borodin, Cui, Mussorgsky and Rimsky-Korsakov. They opposed the growing trend of intellectualism in music, exemplified by the work of Richard Wagner, and favoured a return to simpler lyrical forms and the use of folk music. In 1862, Rimsky-Korsakov sailed as a young naval officer on a journey that would last for three years, during which he visited England and the United States. Although separated from his musical peers he did not abandon composition, and completed his first symphony during the voyage. After returning to St. Petersburg in 1865, he revised the symphony following the direction of Balakirev, and it was performed the same year. Rimsky-Korsakov appeared on stage in his naval uniform to acknowledge the applause. The audience was incredulous that a naval officer could have written such a work. In 1871, Rimsky-Korsakov joined the faculty of the St. Petersburg Conservatory as Professor of Practical Composition. Although he had gained a reputation as a composer he had practically no knowledge of musical theory. In his first years of teaching, he bluffed his way through classes, recalling that "at first none of my pupils could imagine that I knew nothing, and by the time they had learned enough to begin to see through me, I had learned something myself!" With encouragement from Tchaikovsky he began to teach himself harmony, counterpoint, musical form and orchestration. In time he became famous as a music theorist, writing a treatise on orchestration which is still used today. Among his students were Sergei Prokofiev and Igor Stravinsky. His association with Tchaikovsky and the adoption of a more intellectual approach to music distanced him from "the five", Mussorgsky calling him a soulless traitor. The sinfonietta on Russian themes is a re-working of a string quartet which he originally completed in 1879. It is a sunny work very characteristic of the composer. The first movement is based on two fairly short melodic ideas. These are presented in many different settings, with varying harmony and orchestral textures. The form is related to classical sonata form with the exposition ending unusually in the sub-dominant key of D minor. The recapitulation of the opening ideas is quite short, but the coda is greatly extended. Overall there is a sense of continuous development throughout the movement that tends to blur the classical outline. The second movement is a romance based principally upon a beautiful languorous Russian folk tune. It shows the early influence of the five, particularly Borodin, in its use of simple structures and dependence on flowing melody. The folk tune appears three times, each time in the same key of F major. The appearances are separated by more incisive contrasting episodes using 5/8 time. The same folk melody was later used by Stravinsky as part of the dance of the princesses in his ballet the Firebird. The last movement is similar in construction to the first following the outline of sonata form with the exposition again ending in the sub-dominant key, this time D major. It makes use of three melodic ideas the first and most insistent is a short staccato folk influenced tune introduced on the strings. It is contrasted with a singing legato melody heard at first on the violins and a broader dance like tune heard first on pizzicato strings. The movement is fast throughout bringing the work to an energetic close. Rimsky-Korsakov's Sinfonietta was performed by the Portobello orchestra on the 19th April 2008, conducted by Anthony Weeden.